Steven Hull, ''Engine Room,'' 2013, acrylic on wood, electric fan and lights, motion detector, bicycle wheel, paper, wire, string, bamboo, buttons, 10' x 24' x 5'8''. Steven Hull has fun making art. His works are playful installations with miniature steam engines and marionettes. Fans spin and colorful panels are stacked against the wall. 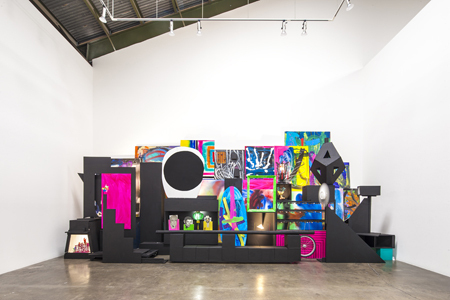 The abstract and representational, real and imagined mingle within room-sized installations. He uses the walls as framing devices and allows his "paintings" to extend into the space so that they become sculptures and paintings simultaneously. While the narrative thread through the work may be obtuse, it is clear that Hull's placement is not arbitrary; he is interested in how the parts add up to create the whole. In this installation he has collaborated with the Bob Baker Marionette Theater, bringing puppets into the mix in order to add another layer of interactivity to the work.